Two girls, two stories, one epic novelFrom Lauren Oliver, New York Times bestselling author of Before I Fall and the Delirium trilogy, comes an epic, masterful novel that explores issues of individuality, identity, and humanity. Replica is a “flip book” that contains two narratives in one, and it is the first in a duology. Turn the book one way and read Lyra’s story; turn the book over and upside down and read Gemma’s story. The stories can be read separately, one after the other, or in alternating chapters. The two distinct parts of this astonishing novel combine to produce an unforgettable journey. Even the innovative book jacket mirrors and extends the reading experience.Lyra’s story begins in the Haven Institute, a building tucked away on a private island off the coast of Florida that from a distance looks serene and even beautiful. But up close the locked doors, military guards, and biohazard suits tell a different story. In truth, Haven is a clandestine research facility where thousands of replicas, or human models, are born, raised, and observed. When a surprise attack is launched on Haven, two of its young experimental subjects—Lyra, or 24, and the boy known only as 72—manage to escape.Gemma has been in and out of hospitals for as long as she can remember. A lonely teen, her life is circumscribed by home, school, and her best friend, April. But after she is nearly abducted by a stranger claiming to know her, Gemma starts to investigate her family’s past and discovers her father’s mysterious connection to the secretive Haven research facility. Hungry for answers, she travels to Florida, only to stumble upon two replicas and a completely new set of questions.While the stories of Lyra and Gemma mirror each other, each contains breathtaking revelations critically important to the other story. Replica is an ambitious, thought-provoking masterwork. Queen Lauren Oliver I have missed you so so much. Every single time I pick up one of your books I fall for the easiness of being drawn head first into a story. "God had made that creature, that monster with a taste for blood, and loved it. But he had not made her." Replica combines the stories of two girls, a mysterious island running scientific experiments, clones, and a whole lot of danger, discovery, and secrets. And when I say two stories, I mean two different stories and POVs in the same book. Back to back. You can choose to read the book one chapter from each POV or you can read one story and then the other. I have never had so many options in a book! It is so freaking liberating! I read the whole story at once, one chapter from Gemma, then one chapter from Lyra. Because I had the ebook this meant using links between the stories. BUT I know (due to having the hard copy of the sequel [b:Ringer|30457727|Ringer (Replica, #2)|Lauren Oliver|https://images.gr-assets.com/books/1487493518s/30457727.jpg|50976062] on my shelf) that the hard copy means you physically flip the book upside down! So obviously I'm stupidly excited to read the sequel for this reason alone. "And she could hear, in the quiet, the whisper of millions of words, words trapped behind every drawer, words beating their fingernails against the inside of the file cabinets." The story itself was gripping and just so engaging to read. I feel so at home with Oliver's writing, it's honestly a joy to read. Having two POVs in a story is nothing new, but I did really enjoy the fact that both 'books' are on the same time frame. This means that if the characters are together you'll hear a lot of the same dialogue from different POVs. I thought this would become tiresome, but it really didn't. It gave so much more depth to the story. The story line, with all the mysteries and twists and turns and secrets and coverups, was just so delicious. it kept me wanting more throughout the entire book and left me so excited to dive into the sequel to answer some of the lingering questions from this book. And the characters. I felt so much for both the MCs, both with their own struggles: Gemma growing up as the 'sickly' child, rich helicopter parents, overweight and struggling with friends; Lyra: knowing nothing beyond her home on Haven, and thinking herself as less than human. But I truly thought that the men in this story were the true gems. All three of these gents made my heart melt in different ways. While there isn't tonnes of diversity in this book, there are bits and pieces on the sidelines. A side character described as 'mixed ethnicity' and a Latina best friend with two mums. I hope this grows in the second book, particularly with some of the key characters. "A strange and baffling truth: that the people we’re supposed to know best can turn out to be strangers, and that near strangers can feel so much like home." 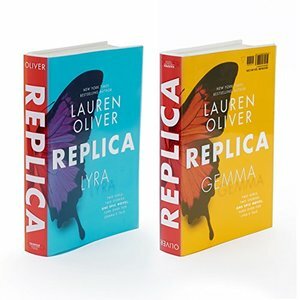 If you love novels based on a conspiracy theory angle, it is a pretty good bet you will love Replica. Now, the specialty of Replica is a dual POV storyline that intersects but is kept apart as two different books. Lyra's part is like science fiction dystopia, while Gemma's part is part-mystery, part-on-the-run adventure. Lyra was a subject in Haven, a facility that secretly creates and houses genetic clones. The clones, called Replicas, are stripped off any human rights, are told they have no existence in reality and that they are less than human. The majority of the world, however, is unaware of their existence save for their investors, shady military types and conspiracy theorists. While the book can be read any way you like - one part, then the other, or in alternating chapters, I started with Lyra, read until chapter 9 (where the two stories first intersect) and then switched to Gemma, read until the same stage of the story, and then alternated. The reason I advocate for this is because Lyra's part sets the stage for the reveals that Gemma's parts bring in that initial stage. After that alternating is the best way to connect the threads being unraveled in either part. Lyra's is the more dynamic part, with her life in Haven and then her life in the outside world. Even so, it is an emotional arc, too, because here is a person who was stripped of personhood, learning her individuality. Gemma's part is more of a personal arc, where she is setting out to find out the truth about her life, to find out what her parents are hiding from her. She is a very empathic person, and immediately bonds to Lyra, making herself her protector. The story works on a science fiction background - of cloning and human experimentation, and the bounds of ethics. There is a religious aspect to it as well, with the religious nuts who see the replicas as abominations, to even Lyra considering them forsaken from the God of humans, and instead considering their creator (the scientist) the god for the replicas. It also alludes to some ethical issues frequently raised in the scientific research community when it comes to using human tissue or cells for research. The science of cloning, though, and programmable cloning at that, is still pretty much in infancy. The timeline of the hiding of the science and the creation of the methods doesn't fit, not when there are actual labs in countries with limited oversight that work close to this field. It also relies heavily on the Evil Greedy Scientist trope, which I'm frankly tired of in science fiction novels. Coming to the characters, there is an intense connection between Gemma and Lyra because of their intertwining status. Their lives and backstories are a big question mark in neon and then it gets all entangled with the information they unearth. There are other secondary characters, but they serve more like love interests which doesn't fully serve the purpose of the plot and emphasizes romantic love in a plot about acceptance and love. Honestly, if 72 was instead a non-romantic partner and Lyra was made queer, it would have been more believable (esp since Lyra was in a gender segregated dorm and hello, big opportunity to have a f/f romance plotline instead!). Gemma's love life was also complicated, with her being attracted to every guy in her age group, but kudos for the chubby girl rep. Replica sets a good storyline, and the dual story plotline is certaily interesting, but not novel. Also, since the alternating chapters don't align in the timeline exactly, sometimes a tense moment in the one person's chapters loses it gravity because it was spoiled in another's chapter. But in full, this book is pretty good and it sets an interesting plotline in a contemporary setting. Received an advance reader copy in exchange for a fair review from HarperCollins, via Edelweiss.